It's that time of year again! I love the fact that Amy puts together the Blogger's Quilt Festival! She does such a fantastic job, so thank you Amy for all of your hard work! I have really been debating about which quilt to enter this time around. 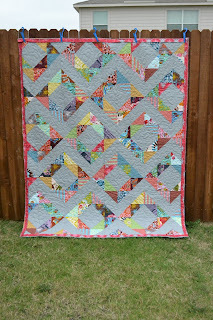 And I have finally decided on my AMH Half Square Triangle Quilt! It is a very recent finish for me. In fact, I finished stitching the binding down last week! I used the Loulouthi line for this quilt. I have been a fan of this line for such a long time and once I got my hands on some of this amazing fabric I knew it would soon become a quilt of my very own! Make sure you go check out all of the other amazing quilts that are linked up over at the festival! I have made a bit of progress with my Weekender Bag over the past weekend! I finished piecing my 120+ blocks and finished quilting them today! I love these blocks! I am so excited to start putting together the bag! I really hope I don't mess this up! These pics have the large front pocket laying on top of the panels. It was not my intention to make the black stripes line up! Unfortunately it didn't work out like that for both sides but I'm okay with that. I plan on spending the rest of the evening reading my directions over and over and trying to get a game plan in mind for assembling the bag! I think I can, I think I can, I think I can! Don't forget that Beth, over at Plum and June is hosting a giveaway today for the Long Weekend Blog Hop. Make sure you go and check that out here! Beth is pretty amazing I know you will love stopping by her blog! Well I have cut some fabrics and have started piecing them together ..... I think I have made my Weekender Bag even harder than it needs to be. But I am hoping my craziness will be worth it in the end. I plan to have some pics of my progress later this week hopefully! I'm not used to paper patterns. I think I read the patterns 20 times because I didn't want to mess anything up! No wonder I had this pattern for a year and a half and didn't do anything with it! The shear volume of print on this page is intimidating, let alone what it's telling you to do! It's a horrible pic but here are some fabrics that I will be using, as long as my plan turns out the way I want it to! Don't forget that Debbie from A Quilter's Table is having a giveaway and offering tips and advice. Stop by here to enter the giveaway and see all the nifty info! 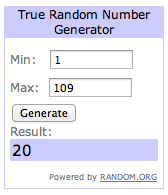 The Long Weekend Giveaway Winner! I am starting to compile ideas for my Weekender Bag and my zipper came in the mail today! I plan on trying to work on it a little this weekend. I will definitely show some pictures once I start the process, but let's get on to the giveaway winner. 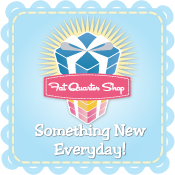 If you remember, the amazing shop, Cotton Blossom Farm, sponsored our giveaway. Up for grabs was a FQ bundle of Gypsy Girl by Lily Ashbury. Allison, I have emailed you! Thanks everyone for jumping in on the giveaway! Be on the lookout because another one might be coming shortly! 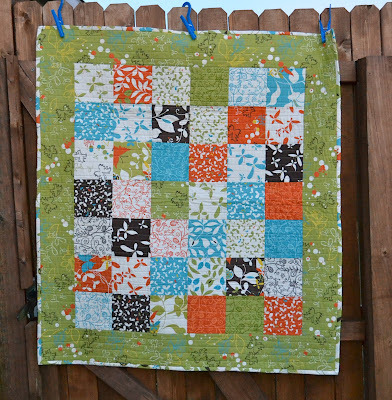 A couple of months ago, Heidi from Fabric Mutt started a Quilt-Along. 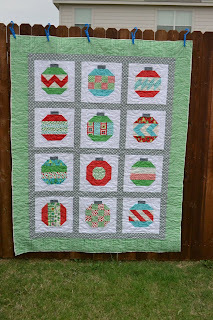 I just happened to have some Christmas fabric laying around that needed to be put to good use. And so a new quilt was started! It is finished! This is my first holiday related quilt and I love it. I don't know about you but my favorite part of the quilting process is piecing the top. 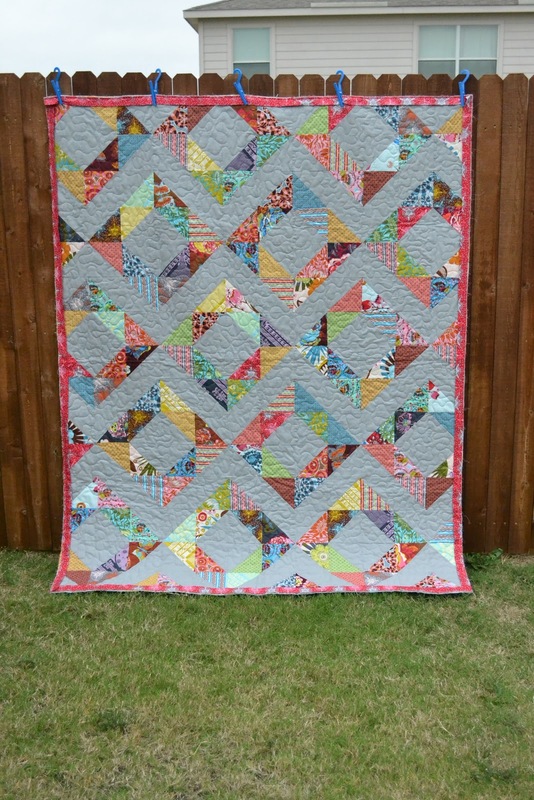 And my least favorite is basting, I absolutely dread basting a large quilt! Well, since the surgery, I'm not allowed to crawl around on the floor and baste quilts. My wonderful hubby says I have to wait at least 6 months to do that! He's uber protective of me, mainly because he knows I push myself too far. But in this instance, I gladly obliged .... as long as I could send it to a long-armer! And that's exactly what I did! I normally don't shell out the money for that kind of thing but oh my goodness, it was wonderful! I love seeing all the fantastic designs they can do! I picked a snowflake pattern and it adds so much to the quilt! I'll be linking this up with the wonderful Heidi! And the 4th Quarter Finish-A-Long! The Long Weekend Blog Hop and a Giveaway! 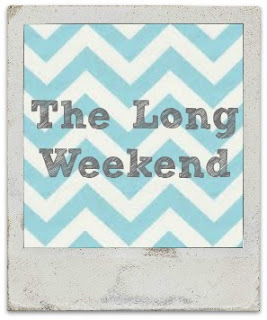 Heidi from Fabric Mutt and I have teamed up to bring you The Long Weekend Event. We both love Amy Butler's Weekender Bag but haven't had the moxy to give it a try yet. I know there are others that also love the pattern but have been a little intimidated by all of the craziness! Well we have decided that it's time to jump in and do it! And since the quilting/sewing community is so amazing we figured what better way to tackle something difficult than to tackle it together! The Long Weekend Event will be a place for us all to learn from each other. 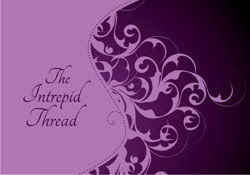 We have a group started on Threadbias; you can find it here. We will be able to start threads to ask for support or offer advice! We will have featured bloggers who will offer their advice from their own experiences with The Weekender Bag. And during the course of events, you could be making your own bag! At the end of the event, you will have the chance to link up your finished Weekender Bag for the chance to win some amazing prizes from our amazing sponsors!!! October 15: Kick Off Day!! I hope you will join in with us, I really do think it's going to be a great event! 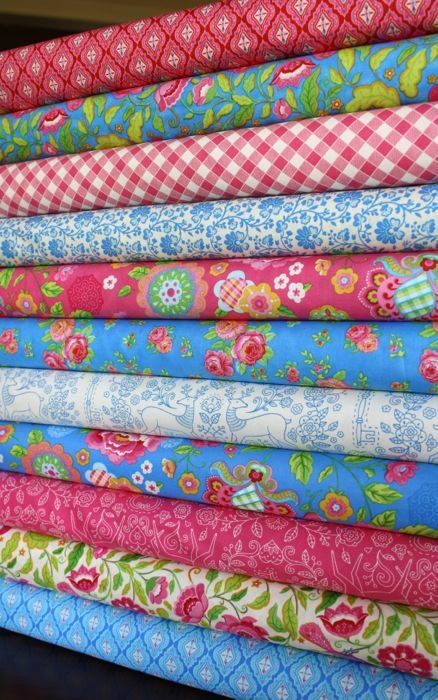 Just in case you need the pattern, Pink Castle Fabrics has some for sale here. They also have been so generous to offer 15% off anything in their shop when you use the code LONGWEEKEND15. The code is good until November 19th. Heidi and I have noticed that the pattern and the zipper can be tough to locate so we have complied a list of places you might want to check out. Here are some of our fabulous sponsors!! Now to kick off our event with a bang, why don't we have a giveaway! Make sure you go and visit Heidi too! She's having a giveaway today as well! 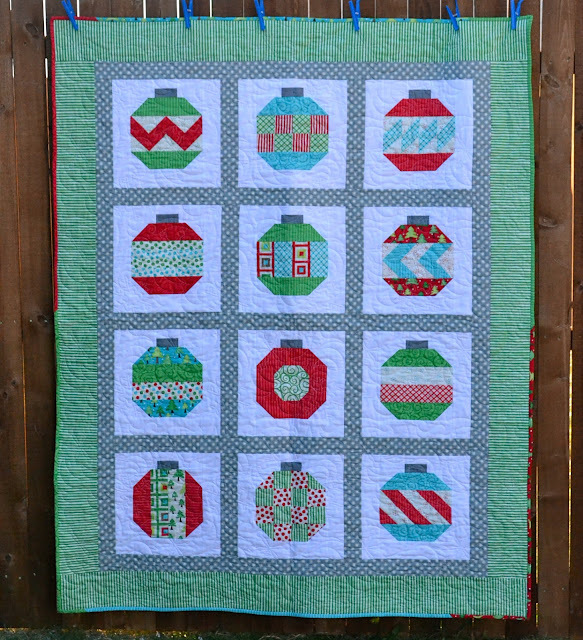 This giveaway is sponsored by the wonderful shop, Cotton Blossom Farm! 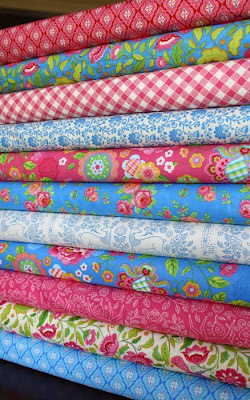 For the giveaway they have donated a fantastic fat quarter bundle of Gypsy Girl by Lily Ashbury. Such a great line of fabric, isn't it? 1. Leave a comment whether or not you think you might join along and what fabrics you are thinking about using. 2. Blog, Tweet, or share on facebook about the event, and leave the link. This giveaway will be open until October 19th at 7am CST. The winner will be announced Friday, October 19th. That's it! I can't wait to see who will be joining us! You will probably see some of my progress over the next few weeks! Wow! This year has really flown by! I have several projects that I need to finish before the end of the year! I am so glad Rhonda from Quilter in the Gap put this event together, it really has motivated me to get some things done! 1. All that needs done is stitching on the binding. I'm soooooo close! This will be done and posted by the end of the week! 2. All I need to do with this is stitch down the binding. This is going to be MY quilt! I am sooooo excited. I absolutely loved how it turned out! 3. This is going to be a Christmas Tree Skirt made from Log Cabin blocks. 4. I need to finish this for a friend. It's going to be a cash system wallet. It's based off the Dave Ramsey money system. 5. I have all of the pieces to make a felt sewing kit. The owl will be the scissor holder. A tree stump will be a pincushion. And a mushroom will be a retractable measuring tape holder. It's going to be so cute. 6. This is a practice pillow. I joined the Pillow Talk Swap and I have a design I really wanted to use for my partner but I have never pieced curves so this is my practice run. So far it's going well! 7. This is the fabric that I will be using for the Pillow Talk Swap. I have the template cut out and ready to go. I just have to make sure that I am confident with piecing the curves! 8. And last but not least .... the Weekender Bag. Heidi from Fabric Mutt and I have teamed up and are hosting The Long Weekend Event! It's a support group for all of those who need a little push to tackle the patter, myself included! This will be done by the second week of November! Thanks Rhonda for creating a fantastic event! I hope you think about doing it again next year! Something New and Fun is Coming! Heidi and I are announcing a new event tomorrow! 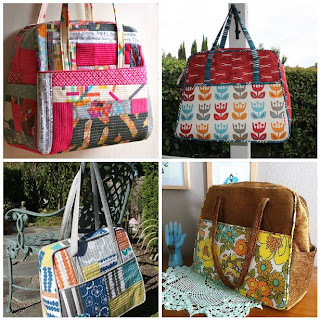 I don't know if you guys have seen all of the amazing Weekender Bags that have been popping up in blogland lately. Well I definitely have noticed, and I have had the pattern in my possession for over a year. But at that time I was newbie in the sewing world and was terrified of the pattern. Even though I don't consider myself a newbie anymore, I am still intimidated by the craziness of the Weekender Bag. So I got to thinking ..... I contacted Heidi .... and we have decided to host an event all based on Amy Butler's Weekender Bag. You could consider this a support group for all of those who are a little scared of trying this pattern. So tomorrow will be our official kick off day telling you about all of the details! There will be giveaways, there will be guest bloggers who will give advice on how they tackled the pattern, there will be a link up party and there will be prizes!!! We have also started a group on Threadbias. If you are not familiar with Threadbias, it's a great program! You can create an account for free. We have started The Long Weekend Event group, and this will be a place where we all can ask questions and can offer support to one another! I hope you guys will help spread the word and consider joining us. We have some fabulous sponsors and you won't want to miss the fun! Back in July I linked up with the 3rd Quarter Finish-A-Long, you can find that post here. Here is a finish that I will be linking up with Rhonda's Post 3rd Quarter Finish-A-Long. 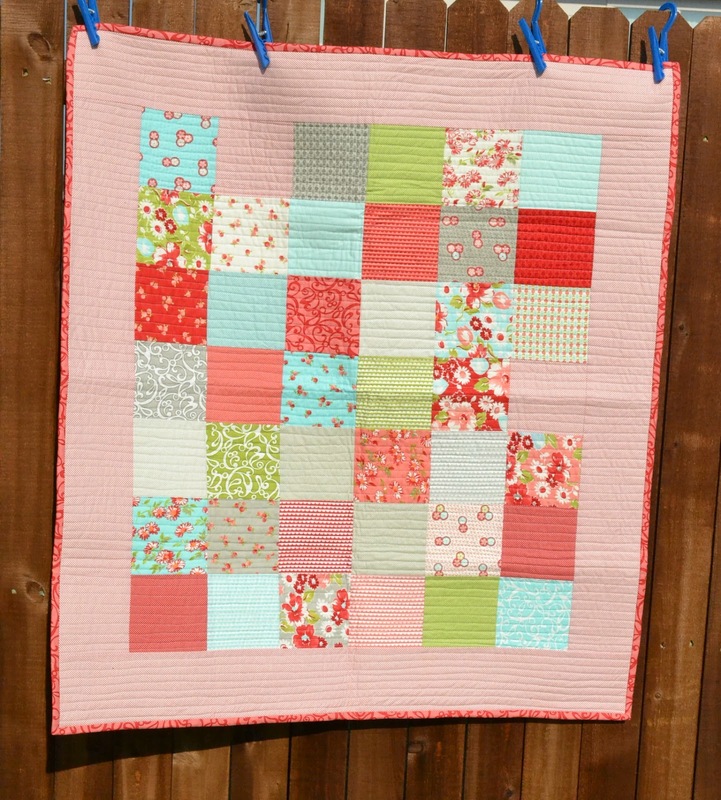 This is a baby quilt made from the Ruby fabric line. Such a cute line for a little girl! This was posted previously but I needed a separate link. Here is one of my finishes that I will be linking up with Rhonda's Post 3rd Quarter Finish-A-Long. 3rd Quarter Finish-A-Long Link Up!! All-in-all, I think I did pretty well. Here are my finishes that I will be linking up with Rhonda's Post 3rd Quarter Finish-A-Long. 1. The finish I am most proud of!!! I actually just finished hand-stitching the binding today! My LQS had a monthly challenge with our Bring and Brag group. For the past year, we have been given two different colors and were asked to make ticker tape blocks with those colors. 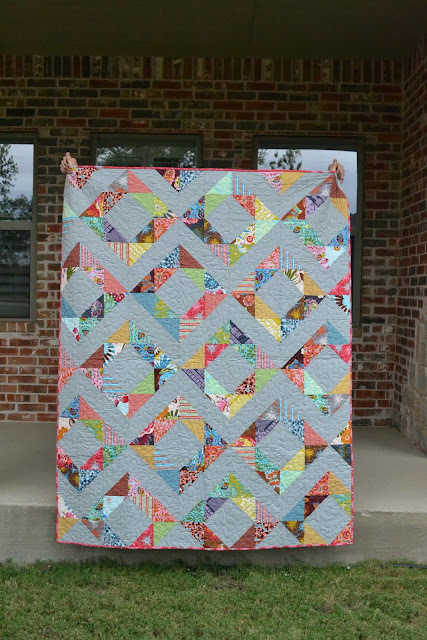 So I pieced all 24 colors, and because I was one of the first ten participants to finish the top, I had it quilted for free!!! I just finished the binding this afternoon. I absolutely love how it turned out! 2. My second finish was a set of Christmas coasters!! I love this vintage print by Alexander Henry. 3. My third finish was the first of two baby quilts. Nothing super fancy here. But it did go to a super cute little girl!! 4. My fourth finish is another baby quilt. It doesn't have a home yet but I do have a friend that is expecting!! 5. My fifth finish is my Christmas Tree Skirt. I love how this turned out. I can't wait to use it this Christmas!! This is a shot of the back. There was only one project that is still unfinished. My pogo stick quilt top is pieced and the back is ready to go. All I need to do is baste, quilt and bind this puppy! But this project will have to wait. I'm not going to be crawling around on the floor anytime soon basting quilts. I was planning on using this quilt to practice my free motion quilting. I should be able to get back to this in about 5 months. Until then I will concentrate on all of those little projects that I have been wanting to do!! !